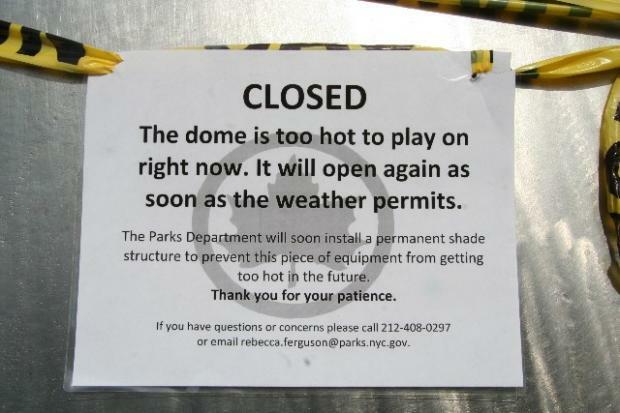 Children were prevented from playing on the dome in hot weather. UNION SQUARE — Union Square’s trendy new playground is proving to be too hot to handle. Only four months after the playground opened, the Parks Department has had to rope off and even take away equipment in the $3.8-million, 15,000-square-foot playground out of safety concerns. 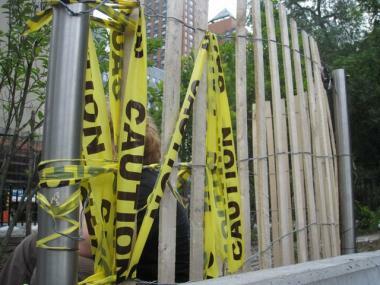 The Parks Department told DNAinfo it cordoned off a steel climbing dome on the east side of the park on Friday because it got too hot. Signs were also placed around the dome that day stating it was closed until the weather cooled down. Last month, a spinning dish was also removed from the playground because it rotated dangerously fast, according to a department spokesperson. 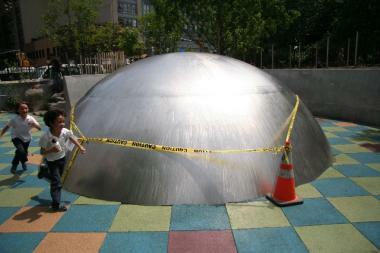 The Parks Department cordoned off a steel climbing dome on the east side of the park because it got too hot. “This is just not safe,” said East Village mom Jessica Inoa, who came to the playground with her one-and-a-half-year-old son on Sunday to see the dome was reopened. “I don’t know if I’ll let my son play here." The playground was designed by Michael Van Valkenburgh Associates, the firm that also designed the Hudson River Park’s latest Chelsea Cove addition along with a playground in Brooklyn Bridge Park, which was recently shut down due to safety issues, including heat problems with similar dome structures. Michael Van Valkenburgh Associates didn’t respond to e-mail or phone call requests for comment. Assemblyman Micah Kellner has recently proposed a bill that would mandate all playground equipment be temperature tested before they are installed. NYC Parks Advocates founder Geoffrey Croft said he has voiced concerns over the playground’s dangers for years and he is outraged that there were not better measures in place to protect playground goers. “Kids are getting burned on the domes, falling off slides because they’re too steep and flying off the spinning saucers,” he said. 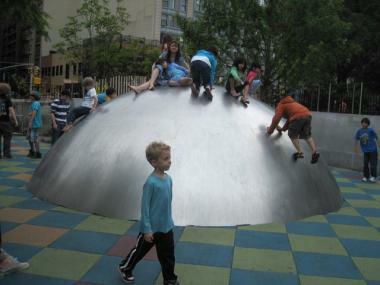 The dome at Union Square's new playground was open on Sunday after being closed off Friday. The Parks Department said workers were in the process of installing a permanent shade structure to prevent the dome from getting too hot in the future. “All in all, we are experimenting with lots of new play elements and are seeking to correct them if they are not working properly,” a spokesman said. For now, Stuyvesant Town mother Sandra Saunier, who takes her 8-year-old son to play in the Union Square playground, said she will use caution. “The bottom line is that you can’t just let your kid run wild in a playground no matter what,” she said. “We will just have to watch out a bit more and use common sense."